Winter offers an opportunity to reset the residuals' level for the coming season and ensure leaf growth is promoted in the base of the sward. Grazing management during winter is about transferring autumn and winter grown pasture into early spring to achieve target average pasture cover (APC) at calving and meet the feed requirements of the milking herd. This is achieved by lengthening the rotation in late autumn and winter, beyond the time taken to grow three new leaves. Moist, cool conditions mean tiller death is low. Ryegrass is forgiving of stress, such as severe grazing, except where high soil moisture leads to pugging damage. Grazing at the 3-leaf stage. In the North Island, rotation lengths may need to be more than 60 days to meet feed cover targets. Use the spring rotation planner to manage the transition from winter to spring and ensure appropriate covers are reached in spring. Winter is the time of year where grazing below 7 clicks/1500 kg DM/ha does not appear to damage ryegrass growth. Pugging (reduces tiller density and allows weed ingress, reduces subsequent pasture production). Consider standing cows off on races/feed pads. Grazing at high stock density on wet soils (reduces subsequent pasture production by up to 45% the following year). High farm covers in August (leads to shading and loss of tiller density). 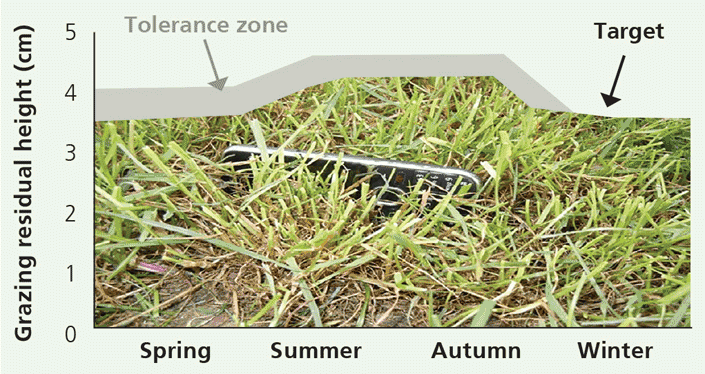 Winter is the time of the year where grazing below seven clicks does not appear to damage ryegrass regrowth. Grazing as low as 2.5 cm or 1200 is possible without reducing pasture regrowth. This is because stubble energy reserves are higher due to slower plant growth and less energy use at night due to the colder temperatures. Wet weather during the autumn and winter months increases the potential pugging damage to pastures as soils become waterlogged. Soil compaction and structural damage. Use on-off grazing with a well-designed and managed stand-off area. On-off grazing is the most effective grazing strategy for minimising pugging damage. It involves having stock on pasture or crop for short periods of time. For the rest of the time use a well-designed and managed stand-off area. Ensure cows have enough space to lie down - at least 3.5m2 per cow if on woodchip, sand or concrete for up to two days; at least 5m2 on woodchip or sand for more than two days; and 8m2 if on crops or feed-out paddock. Shift stock regularly (twice per day) and back fence to reduce excessive treading. Use electric fences to protect damaged or sensitive areas such as bare patches, seeps and wetter soils. A sacrifice paddock is one way farmers choose to manage their cows and pasture when there are no purpose built stand-off facilities, or where off-farm grazing is not an option. A sacrifice paddock can take the pressure off the rest of the farm by allowing grass cover to build up while vulnerable soils are wet. The regrowth of a small area of pasture can be sacrificed to enhance the regrowth on the rest of the farm. Some farmers use a sacrifice paddock when it is dry in autumn. By feeding supplements on a sacrifice paddock it allows future paddocks in the round to build up pasture covers. For more information: Tips for managing sacrifice paddocks in the Waikato.